The White Trail has led me on quite a voyage, from England to the Continent, to Egypt and the Fertile Crescent, then on to the Caucasus and Anatolia, with a few side trips to France, Italy, Portugal, Spain, Scandinavia, Malta, Crete, Mexico, Peru, etc. Ancient history is like that, one place leads to another, but if I traced back from any of these places, I always seemed to end back in the Fertile Cresent, Egypt and Nubia. The land of the Hitittes was very interesting. Eventually I wandered back to the Queen Stone…..and Stonehenge. The outcome of some of my adventures were written about in the previous four parts. What I came to realize, was that there were some very well educated people among all of these societies. Astronomy, higher mathematics, surveying. architecture, healing and navigation being among some of their knowledge. They had knowledge about farming and irrigation systems. They also seem to have spread around, sometimes very quickly, sometimes somewhat slower. Navigating oceans has seldom been taken seriously when it comes to ancient people, but the ancestors of the Aborigines of Australia left Africa c30,000 BCE. They didn’t walk all the way to Australia, so must have sailed part of the way, even if they were island hopping, they were still out at sea. Some of these people must have understood astronomy, or they wouldn’t have set out on the oceans. People who didn’t understand astronomy and navigation, didn’t venture too far from shore. People who did venture out onto the oceans, did understand astronomy and navigation. There was no other way in ancient times. It doesn’t matter how far back in history we go, if someone sailed out on the high seas, they knew what they were doing, which means they understood astronomy and navigation. A map such as the one made by Oronteus Finaeus, dating 1531, didn’t just arrive out of his imagination, someone mapped Antarctica when it was in that condition. It was thousands of years ago, long before ‘recorded history’, and they obviously understood astronomy, navigation and map making. The Windmill Hill people have been likened to an ‘invasion of farmers’. North America could be said to have been invaded by farmers also, but they didn’t come without uppers, craftsmen, knowledge of herbal medicine and religious heads. In North America, the fishermen and navigators came first, then the rich folks and the farmers to settle the land. Explorers and craftsmen followed. The navigators brought the first priests, and other sects brought their own preachers. Many people came in groups with their religious heads, so that they would have freedom to practice their religions in a new country, which had few people compared to where they were coming from. The early European explorers in North America must also have understood the rudiments of astronomy, or else they would have become hopelessly lost…………which for the most part they didn’t. The Windmill Hill people had well educated people among them, and quite possibly a well ordered culture, with its own laws and religion(s). They couldn’t have built what they did without some sort of hierarchy and a cooperative society which was willing to work on large construction projects, such as Windmill Hill, the West Kennet Long Barrow, Avebury, Silbury Hill, Stonehenge, and the list goes on and on. These people from the Neolithic seem primitive to us, but it was only their materials which were primitive, not their minds. The only difference between them and us, is all the creations and inventions we have today, 7000 years later. What we have today is a collection of the knowledge we have gained in that 7000 years. But in all that time our brain capacity hasn’t changed from theirs. They did things that we, with all our technical knowledge, have few answers for. How did they build the pyramids? How did they manage such big stones that we see in many different countries and continents? How did they haul them up mountainsides? How did they make the joints in between the stones so perfect that you can’t even stick a piece of paper in between them? To this day……………! At one time people knew how to do this, we don’t. It’s time we stopped thinking about these ancestors as half wild savages, running around in bits of animal pelts and grunting at each other. One thing which seems to be missing, is writing, but this is because we’ve never found any of their writing. Or at least, we, haven’t recognized some of their ‘writing’. However, in many places such things as birch bark, hide, or a slab of wood could have been used to make notations on. In the UK and Ireland, they would have rotted long ago, so we think they had no writing. All their baskets and textiles have rotted also, but since basketry is one of mankind’s oldest crafts, we know they had them. The Queen Stone shows that some of them did use a form of writing. According to Barry Fell, an amulet with Ogham on it was found on Windmill Hill, it has been dated c3500-3400 BCE. When I did the layout for the Aubrey hole circle, I discovered the Forfeda. That was added last to the Ogham tract, and is connected to Manannan and his Crane Bag. Manannan’s Crane was Cygnus. When it was no longer circumpolar, at lower latitudes, it became his dead crane, and out of the crane came the Crane Bag which held all his treasures. Manannan was an archetype of astronomer/sailor/merchant/shaman/priest/king, and his Crane Bag became some of the stone circles which were created. In Great Britain, many circles are surrounded by white, Stonehenge being only one example. Although many triple circle formations are said to reflect Orion, I would say that it is Cygnus which is involved. Some are even on a cursus, perhaps meant to be the Milky Way. 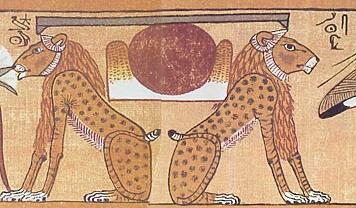 Some circles may also represent the egg which was laid by Thoth as the Ibis/Cygnus. Out of the egg came the sun god, Ra. Most stone circles do have solar alignments. The picture below comes from the Book of Lindisfarne, it’s the XPI page. The big X, the P and the I have been made to look like a big bird which is laying an egg with its wingtip on the Mound of Creation. This mound has the head of an ibis. I discovered that not all triskles were purely decorative, many made up other pictures, creating another layer of meaning. When the picture is turned sideways, you can see a man’s head wearing a sort of turban with two long tails floating behind him. He has two pink eyes, round pink cheeks, and a beard which is flowing towards the right. This bird looks more like a swan, but here is Cygnus turning into a calendar circle with an astronomer, likely Manannan. I say, likely, because in the Book of Kells he has a red M on his forehead. I’ll have another write up about some of the interesting pictures in the Book of Kells and the Book of Lindisfarne at a later date. This is where we seem to come upon a clue which shows us that there was more than one lot of people in the Isles early on. People who created their own mythologies later, but here we have Cygnus as a swan, the egg, and the ibis headed Mound of Creation, but also an astronomer. The legs or foundation this bird is standing on, is a staff with a hook in it and a straight staff. A pair of astronomy/surveying sighting devices. The gent’s beard is pointing towards a Sun symbol, the black dot with a circle around it. The Irish mythologies do tell us that there were more than one group of people who migrated to Ireland. Among the ealiest were the Firbolg, who were the farmers. The Tuatha De Danann seem to have been the more educated, technically advanced ones. Nuada’s silver arm for instance, this could actually be the mention of a very early prosthesis. That’s not to say that the Firbolg didn’t have educated people among them, since they do seem to be the Windmill Hill people, but serious metal smithing doesn’t show up until quite some time after the Windmill Hill people arrived in England and Ireland. All the different groups of people who went to Ireland, did so by sea, so they had astronomers and navigators among them. The first Manannan was Little Manannan, son of the Sea, said to be a Druid of the Tuatha De Danann. Among the mythologies about the Druids, we find that they gained much of their knowledge from the Dodmen or Leymen as Alfred Watkins calls them. They were obviously astronomers and surveyors. Surveying is a child of astronomy. We can see this quite plainly with the Apollo/St. Michael Line as well as the St. Michael’s Ley, they both have astronomical connections. But just like snails, there were Dodmen who were terrestrial as well as aquatic. Some of them worked on land, while others were sailors. Ships also leave a white luminous trail in their wake. To follow either one of those lines from one end to the other, you would have to cross water along the way. If the St. Michael’s Ley did go all the way to Heligoland, they would have to go part of the way by water after Doggerland and Doggerbanks no longer existed. All the islands which are found on these lines of incidence, were once considered holy islands. Corfu was originally called Korkyra. The god Poseidon fell in love with a water nymph named Korkyra. After abducting her, Poseidon took her to an unnamed island which he named Korkyra in her honour. Right away we find ourselves with a major god of the sea. To get from Mount Carmel to Corfu, you’d have to go by water. Delos was the island where Leto gave birth to Artemis and Apollo, and eventually it became sacred to Apollo. Mont St. Michel once had a shrine to Belenus long before the Benedictines built their monastery there. St. Michael’s Mount was named Dinsul or Citadel of the Sun. Locally it is still known as Karrek Loos y’n Coos, or Grey Rock in the Woods. Cornish, Coos=Welsh, coad=English, wood, but Irish Gaelic, grove. The word, llwyd, is another one like gwyn, in that it denotes colour as well as meaning holy. So this place may have been Holy Rock in the Woods or Grove. Llwyd is pronounced llue-id, connected to Llew/Lugh/Lug/Lugus, that’s why it means holy. This Cornish name is an example of amazing folk memory, since the forest that existed around St. Michael’s Mount has been under water since c1800 BCE. The Tin traders knew the area around Lands End as Belerion, which seems to connect it to Belenus. Since Belenus was a Sun god, and St. Michael’s Mount was known as the Citadel of the Sun, this seems quite logical. Skellig Michel is connected to the Tuatha De Danann, and may possibly have been a Druid mystic’s retreat before it was given over to the Benedictines. Heligoland was originally, Heyligeland, or Holy Land, and was said to be the home of the god Forseti. Even when Doggerland was in existence, Heligoland would have been an unusual land formation. Geologically it was different from all the land around it, and was much higher than the rest. It may have been considered holy before Doggerland was flooded, but likely much more so after all the rest disappeared. Heligoland has amber, which seems to have become very popular in England. Archaeologists think that the first amber shipment which arrived in Mycenae c1700 BCE, came from England, because the spacer plates on the necklaces were the same as the ones in England, but they appear in England at least two hundred years before that. All this surveying and astronomy shows up in all other megalithic constructions, regardless of where in the world they appear. What isn’t clear, is how old some of those sites were, since it is quite possible that astronomy was practiced at some of them long before any major construction took place. Like at Stonehenge, where posts were placed on the Equinox line c7000 and c6000 BCE. More Equinox markers show up on the Aubrey hole circle which was contructed c3200-3100 BCE. Station Stone 93 to F and Station Stone 94 to post hole C are also on the Equinox line, suggesting that astronomy was practiced there as far back as c7000 BCE at least. Manannan kept his treasures in the Crane Bag. These are the Forfeda, the rolled up strip of the whale’s back, and all the other letters in the Ogham tract. The whale’s back is the line that all the other letters sit on, and is also the measuring cord. The Forfeda come into the picture with the layout for the Aubrey hole circle. The first symbol of the Forfeda is X, and that’s what you get when you join Aubrey holes 56-28 and 14-42. These are the directional cross quarters, and so are X. My first move was X which stands for the Grove, the Sacred Place, all knowledge available past, present and future. The Aubrey hole circle being a calendar device, one can look back into the past as well as into the future, and tells you where you are at present. But if the Grove contained all knowledge available, then a great deal was taught there. If you join Aubrey holes 7, 21, 35 and 49, you get a square, and even though it does not sit exactly E/W, N/S, this does give you Oir or Tharan, the Spindle tree, the Square of Enlightenment. These holes became the corners of the the square which I used to string the Sarsen circle, the Trilithons and the Y and Z holes. Spindlewood was used for spindles (for spinning), bobbins and pegs. Surveying pegs? My original suggestion for the Aubrey hole circle started with markers at 7, 14, 21, 28, 35, 42, 49 and 56. These would give you the quarters and cross quarters of the circle. After that, I found the two parallel lines crossing two parallel lines, which gives a lozenge with angles 100° and 80° as best as you can get on the Station Stone quadrangle. From this formation, I got marks at 5, 7, 21, 23, 33, 35, 49 and 51, which when connected created two more parallel lines crossing two parallel lines. When the distance between each set of Aubrey holes was divided in two, it established eight places on the Aubrey hole circle from which the distance between Aubrey holes could be calculated. These two parallel lines crossing two parallel lines makes the symbol for Honeysuckle, the hidden secret. The Wessex lord’s large gold lozenge has angles of 100° and 80°, and it even has the symbol for the hidden secret in the centre of it. Phagos, the Beech, the Hook was the astronomy/surveying device, and the Aubrey hole circle will give the cardinal directions, which will give you lines of longitude and latitude, which is the Net. Colin Murray calls the Net, the Sea, but it is sometimes referred to as the weave of Manannan’s shirt. The Sea is connected to the Moon, and represents maternal connections. Those maternal connections may have been to Hathor, since she was appealed to for good weather by sailors. The blue-stone was still being washed by mariners and fishermen on Fladda in the Hebrides up until fairly modern times. In Egypt, all blue stone was connected to Hathor. The goddess Inanna was very fond of Lapis Lazuli, she was Venus, but her father was Sin the Moon god. By using the first three letters of the Forfeda, using Phagos, the Hook and the measuring cord, the strip of the whale’s back, they created the Aubrey hole circle, and lines of longitude and latitude were among the outcomes. By the time the Temple was built, they definitely knew the four cardinal directions. That line of light which shows up just before noon every day (if it’s sunny) sits N/S, and was obviously built into the place on purpose. A very mariner-like sighting line, since one of the main sightings of the Sun at sea, is taken at noon. In the Ogham tract I use, Phagos is symbolized by the Beech tree. Slabs of Beech were used to write on. Beech is used for bentwood furniture, a thin branch could be bent into a hook. It symbolizes old knowledge, old writing. How old?…………… that’s the question. The Forfeda are supposed to have been added last, but if that started with the Aubrey hole circle, then the rest of the tract must have been in existence before that. Since they were also in the Crane Bag, they may represent the wooden pegs which were used in the surveying. However, it is believed that these letters may have their root in tally marks, which gives us merchants and sailors. The Stonehenge site can be ‘read’ using Ogham, which I found incredibly odd, but made sense. The letters in the Sator Square gave symbolic meanings of the letters, the Ogham wasn’t used to spell out words or to create sentences, they only gave symbolic meanings. What I am translating at Stonehenge also gives symbolic meanings, I haven’t tried to spell out words. The various elements of the site have numbers attached to them. One Altar stone, one Heel stone, so they are Birch because that’s the first letter in the tract and only has one line. Rowan is two, Willow is four, White Poplar is nineteen, etc. The Aubrey hole circle will give you two divisions of seven and twenty one between the Station Stones. The seventh letter is Duir, the Oak, solid foundation, solid protection, the doorway to enlightenment/ the Mysteries. If you learned the Mysteries, you’d be enlightened. Among the Mysteries taught there was astronomy, higher mathematics, surveying, weights and measures, smithcraft, healing and navigation. Being able to navigate the seas in 3000 BCE would have been an important piece of knowledge. Oak has been used in ship building since ancient times, and would give a solid foundation and protection at sea. Druid is said to mean Oak priest, they were the doorways to enlightenment because they were the teachers, and they scattered acorns all around, who grew up to be more doorways to enlightenment. It still goes on today, we still have teachers and pupils. The difference being, that their knowledge was only available to a select few, while ours is available to everyone. No doubt, any child that showed any inclinations toward higher learning would have been taken into the group. Powdered Oak bark was used as a medicinal astringent for sore throats, burns and cuts. Used as a snuff, it will stop nose bleeds. The bark contains a high amount of tannin and was used to tan hides. Oak chips can be used to smoke meat, fish, fowl, cheese and other foods. Oak galls were used to make ink. Acorns can be mast for pigs, and properly prepared, can be ground into flour and acorn coffee. The Oak tree is sacred among many cultures. The twenty first letter is the Grove, all knowledge available past, present and future. The Grove contained all the other plants, bushes and trees in the Ogham tract, all of which contain their own meanings and knowledge, so the Grove is a collection of all this knowledge. Almost all the trees, shrubs and plants have medicinal uses, but many have other uses as well, for making tool handles, spear shafts, spoons, spindles for spinning, buckets, furniture, building, etc. Many have blossoms attractive to bees, while others have fruit, nuts and other edible parts. If Stonehenge was the Grove, then there was quite a bit more going on there, besides training astronomers, surveyors and sailors. And burying the dead, which at the moment seems to be its main use according to Mike Parker-Pearson. Neil Oliver reinforced this idea on his BBC program, History of Ancient Britain, by walking around Stonehenge in the snow. What the ordinary viewer doesn’t know, is that England was much warmer then, they had no ice and snow. Saying that Stonehenge is nothing more than a Temple of Death, would be akin to archaeologist digging up Westminster Cathedral in five thousand years, and calling that a Temple of Death. After all, there are many people buried there, particularly the rich and famous. The people buried at Stonehenge were the rich and famous of their day, but that doesn’t make Stonehenge a Temple of Death anymore than Westminster Cathedral is now. There are four Station Stones, the fourth letter is Saille, the Willow. Colin Murray writes, “the passing of time is marked by both the rhythmic cycling of the Moon and Sun, together creating the pattern of the year, punctuated by nights and days”. The Station Stones were set up according to the maximums of both the Moon and the Sun. The Station Stones were used to create the lozenge, which was used to determine the distance between Aubrey holes. These were used as a calendar, which takes note of the passage of time, days and nights, and cycles of the Sun and Moon. They were also used for some interesting astronomy, independent of the Temple. The sighting lines pass by the Temple and were likely used before it was built as well as after. I have not come to a complete understanding of these as yet, will have to do more astronomy work, but I suspect that they have to do with eclipses. Willows like water, and their leaves and bark contain salicin which becomes salicylic acid when ingested. This is the same substance we find in aspirin. It was used in Sumer, Egypt, Greece, and in North America by the indigenous people. No doubt it was used by many ancient people, they just didn’t leave any documents saying so. Willow wood was used to make rope, paper, flutes, baskets, fish traps, wattle fencing, and a host of other things. The Altar stone and the Heel stone are Beith, the Birch, since there is only one each of these. Birch shows the way, a new start, beginning. The Altar stone was a marker for the longest and shortest day. Because it has many mica flecks in it, it would be luminous just like the snails trail. This was the hub for the White Trail in the UK. This was the Temple of the astronomers, mathematicians, surveyors, mariners, healers, and oracles. The Heel stone or Freyja’s Road, marked the cycles of Venus and Jupiter, as seen in the conjunction with the Sun in 3133 BCE. It was a marker for the eclipses close to the Winter and Summer Solstices. An extract of birch bark can be used as a glue, or a dye. Birch bark can be used to write on, to make boxes and containers, and make a cast for a broken limb. It is first soaked in water, then wrapped around the affected limb, it hardens as it dries making a good cast. White birch sap can be used as a sweetener, and a tea made from the leaves was used to treat gout, rheumatism, arthritis, and can be used to disolve kidney stones. It also lowers blood cholesterol. The sap from birch can be used to make wine and beer, and the inner part of the bark can be eaten. Birch leaves give a yellow dye. Maypoles were traditionally made from birch……….birch leads the way. On the Isle of Man it was used for ritual birching once a year to drive out any evil intentions. It should be noted that these were evil intentions, not evil spirits. In North America, birch bark was used to make canoes and tepees, apart from smaller things such as boxes, baskets and other containers. Some of these were decorated with colourfully dyed porcupine quills resembling embroidery. Since there are five Trilithons, these are Nuin, the Ash, which is the Cosmic Ash, that which links together the microcosm and the macrocosm. The ground and the sky. Or our Earth as the microcosm and everything else in space, the macrocosm. There are five lintels on these, Ash again. Ash was used for axe handles, and handles for other agricultural implements, because of the straight grain, it has ‘give’ meaning that it is somewhat elastic. Oars were also made from ash. From Colin Murray, “In Celtic cosmology in particular (the Ash) connects the three circles of existence-Abred, Gwynedd and Cuegant-which can variously be interpreted as past, present and future, or as confusion, balance and creative force; there being no hell, but only continual rebirth as passage from circle to circle until the Land of the Blessed is reached”. We come from the Great World which is Annwn, and live through everything, and come to know everything in the Little World-Abred. We will continue to move from Annwn to Abred to Annwn, etc, until we have become enlightened beings, at which point we move on to the Land of the Blessed or Gwynedd. Celts did not seem to think that we would attain Ceugant, only the Creater exists there. In other phylosophies this is called the Wheel, and again we will stay on the Wheel until we become enlightened beings. However, the earliest idea of a world tree comes from Egypt in the form of the Akhet and the palm tree. The symbol connected to the Akhet is two hills with the solar disc between them, which makes it astronomy again. This device of two hills with the solar disc between them was used as an astronomical marker at certain ancient sites such as Maese Howe, and can be seen on the chalk drums from Folkton which date c2300 BCE. There are ten uprights in the Horseshoe, which gives you Quert, the Apple, which is connected to the Celtic Apple Lands, or Avalon, and apples show a pentagram when cut widthways. The pentagram was sacred to the Druids, and one story will have it that they had pentagrams on the bottom of their footwear, leaving blessings wherever they walked. Apples are good to eat, are high in fibre and antioxidant compounds, and can be made into jam, jelly and cider. They can also be sliced and dried for longer storage. Apple wood was used to smoke meat, it gives a sweet flavour. Pigs, fattened in the fall with apples, will make very tasty pork. Thousands of pig bones were found close to Durrington Walls, they were about nine months old when butchered, and yet, their teeth were rotten. This shows that they were fattened on purpose, and likely did have a diet containing many apples, after all, they were in the Celtic Apple Lands. Seems there just may be something much more homely and down to earth about these Celtic Apple Lands. Apple trees are thought to have been the earliest domesticated fruit trees. They are part of several mythologies. All together there are fifteen stones in this Horseshoe. The fifteenth letter is Ruis, the Elder, the end in the beginning and the beginning in the end, the Cauldron of Immortality. When you consider that the Sun rises NE and shines SW on the longest day, and does the reverse at Sunset on the shortest day, this end in the beginning and beginning in the end, makes much more sense. Medicinally, elder flowers are used for colds, sore throat, rheumatism and gout. An infusion of elder flowers can be used as an eyewash for conjunctivitis or as a compress for skin irritations and chilblains. Elder flowers can be dipped in batter, fried, then sprinkled with sugar and crushed nuts. Elder berries are used to make wine and cordials, and can be used to make violet or purple dyes. Elder leaves give nice green dyes. Each Trilithon looks like the symbol for Luis, the Rowan, which gives protection against enchantment, control of all the senses, but is also connected to Runes, Rowan was used to cut Runes on. Long ago, Rowan was used for metal divining, just as Hazel is used for water. The Rowan helps you not to deviate from your path. It’s only Sunset of the shortest day which appears between the uprights of the Great Trilithon, no deviating there. This is true for the other sightings of Moon and Sun events which show between the Trilithons and the Sarsen circle. It is only from one spot within the Horseshoe where you will see them. For the shorter four Trilithons, each sighting spot is different, no room for deviating because the openings are so narrow. Rune stones were used as oracle stones, oracles tell you about the past, present and future. So would the Trilithons. The sightings between the Trilithons tells you what part of the year you are in, and shows two maximums of the rising and setting of the Moon, and one rising and two settings of the Sun. Eclipses of the Moon closest to Summer Solstice happen between the uprights of the Great Trilithon. Sirius appeared between this Trilithon the night before Winter Solstice c3000 BCE. Rowan was used to cut Runes on, for metal divining, for wands, walking sticks and Druids’ staffs. The fruit can be made into jelly, jams, liqueurs, cordials, country wine, schnapps or Vogelbeer. The fruit can be used as a mordant in vegetable dyes, and the leaves and fruit were used in divination insence. The blossom end of a Rowan berry looks like a small pentagram, a symbol of blessings and protection. Pieces of Rowan were kept on ships to avoid storms, kept in houses as protection against lightning, and over barn doors to protect the cattle from disease. The tree has a very long tradition in European folklore and mythology, it was considered a magical tree for protection against all nasty things in general. When considered from a mariner’s point of view, control of all the senses was very important. Watching the sky and the water meant that you were looking for anything unusual happening there, so you would know what sort of weather to expect. ‘Feeling’ the ship was important as well, different vibrations of the ship tell you different things, such as a change in the currents. The Sun, Moon and stars were used to navigate by. Smells tell you when you are close to land, even when you can’t see the land, which means that you can start running into underwater rock formations in some cases. Sailing the oceans long ago was an endurance test. As a sailor you would have to be in good physical shape, be nimble and agile, and be able to ‘roll’ with the ship. You would need an even temperament, be patient, and be able to work as a team with the other occupants of the ship. Once you get out on the high seas, there is only the water, the sky, the ship and the crew, best if everyone gets along. All your senses would have to be fine tuned. The Bluestone Horseshoe is Eadha, the White Poplar, letter number nineteen, which helps rebirth and prevents illness. This has to do with healing. In my area, the early settlers were taught by the indigenous people to make an ointment from Poplar. It was used to treat scrapes, cuts, bruises, burns, chapped hands and faces, skin infections, rheumatism and arthritis. The settlers called it Balm of Gilead, after the medication mentioned in the Bible. The buds are covered in a resinous matter, which may be separated by boiling them in water. This liquid can be used as a stimulant, tonic, diuretic and an antiscorbutic. A tincture can be used for complaints of the stomach, chest, kidneys, rheumatism and scurvy. Aspens and other Poplars contain salicylates, compounds related to aspirin. A herbal tea can be used to treat mild urinary tract inflammations. The Ojibwe used the inner bark of the trunk as a poultice, while the Cree ate the inner bark in the spring as a mild purgative. It was Poplar that was used by the ancient shield makers, and since the leaves rustle in the wind, it was regarded as that small still voice of God. The Poplar has three atributes: an ability to resist and shield; and association with speech and language; and a close relation with winds, which is important for sailing. Medications made from Poplar sound as if they would be a pretty good pick to take aboard a ship. Celts never swore an oath by any god or goddess’ name, they swore by the wind instead. The Romans and others found this odd, but the wind brought that still small voice of God, heard in the rustle of the Poplar leaves. If the Bluestone circle did have sixty stones, then it could be three times Eadha with a dot between each set of nineteen. But no one seems to be too sure how many there were originally, could be 57. If there were sixty, then it could be three times Ioho, the Yew, which is the twentieth letter, and is connected to rebirth, everlasting, and reincarnation. Yew trees can live for thousands of years, and was the choice of ancient bow makers. Drugs to treat certain cancers are made from the leaves of European Yew trees. If the Bluestones represented the Primordial Waters, then we are back with the oceans of the World, since they are the Primordial waters. Ocean water, under certain conditions can also be a good healer, and it gives a variety of food. Taking into account those letters made up of lines only, that is, not including the Foreda, we end up with sixty lines, and as far as we know there were sixty stones making up the Sarsen circle, that’s uprights and lintels both. The lintels however, are the strip of the whale’s back, the uprights the letters, this makes thirty lines. The first five letters of the tract, or the B group as they are called, is the only part of the tract that actually looks like the Sarsen circle. This gives fifteen lines, and so the message could be read twice. In the beginning (Beith/Birch); it was built for protection against enchantment, control of all the senses, and to help you not deviate from the true path……………..as in creating ley lines and mariners maps (Luis/Rowan); was oracular and protective (Fearn/Alder); was connected to the Sun and Moon making the pattern of the year, punctuated by days and nights (Saille/Willow) and was a link between the microcosm and the macrocosm (Nuin/Ash). The enchantment it protected against were the Equinoxes. 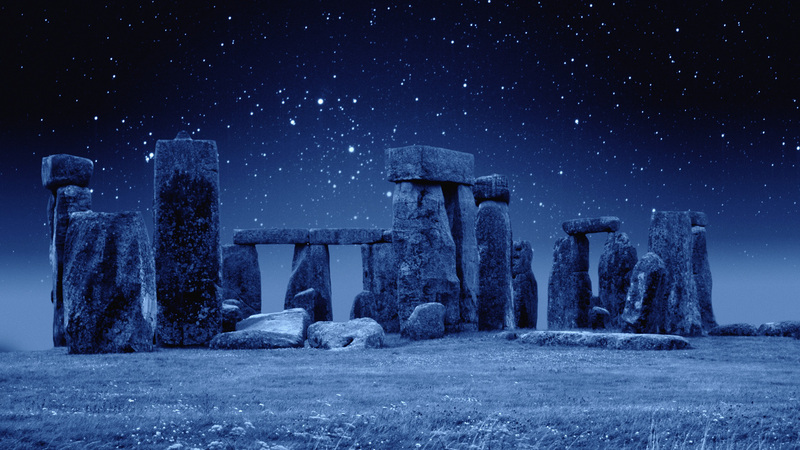 Stonehenge, from the time the Temple was built, was connected to the Solstices. For a temple of that age, Stonehenge is rather unusual, since most early temples in the Middle East were Equinoctial. Some of those temples were not as old as Stonehenge. Looking again at the story of Lugh and his wife Flower Face, I’d say that someone tried to make it Equinoctial. You’ll remember what happened to the Lugh hanging at Stonehenge on the Equinox, the beam of Sunrise hit him right in the thigh, and that is where Lugh was injured when his wife and her lover tried to kill him. (1) This wounding in the thigh runs through several mythologies. Once the Temple was built, it was definitely connected to the Solstices rather than the Equinoxes, otherwise the Thrilithon Horseshoe would have been turned so that Sunrise at the Equinox would shine right into it. There may have been a disagreement about this when it was built. The oracular part comes in because it foretold the movements of the Sun and Moon, and took into account the Eclipses. On the Gwyn Stone, with its double message, Stonehenge is the Ash tree in Avalon. Avalon being the Celtic Apple Lands with Glastonbury Tor at their centre. It was the Cosmic Ash, the link between the Earth and everything else out in space. There are different ways to combine the letters and still divide them ito 30. Beith/Birch plus Saille/Willow will tell their message six times. However, singly, only the letters consisting of 1, 2, 3, and 5 lines each can be read on the Sarsen circle, since only those numbers can be divided into 30, which leaves over all the letters consisting of 4 lines. There are four of these, giving 16 lines, that Mystery School number. Number 4 is connected to hidden secrets, I’ve found, the symbol for hidden secrets has four lines also. The trees are Willow, Hazel, Blackthorn and White Poplar. Willow is connected to the Station Stones, the layout for the Aubrey hole circle, the calendar and eclipses……..all secret. The Hazels of Wisdom is shorthand for all the knowledge the Druids had…….more secrets, accessible only to the chosen few. Blackthorn or Straif is connected to the English word, strife. It symbolizes perseverance in the face of difficulties. Obviously, the builders of Stonehenge must have had perseverance in the face of difficulties. Hauling huge stones from a great distance, and then erecting them wasn’t the easiest thing to do, in fact, we still do not know just exactly how they did this…………..more secrets. The White Poplar is connected to healing, and long ago most of this information was known only by healers, and so falls in the category of secrets. Healing wasn’t secret because they didn’t want people to understand it, but because many of the plants, fungi and other ingredients in their medicines can be deadly if not used correctly. It isn’t known how old herbal medicine is, but it is known that Neanderthal used herbal remedies. Most women would have known basic remedies, and techniques to deal with illness and injury, but the healers would have known all there was to know about this subject at the time. This was one subject which was passed on from generation to generation, it was important to their society’s welfare. Put all together, the above mentioned trees would give you many things. Wood for building ships, making tool handles, spear shafts, bows, shields, oars, buckets, bobbins, spindles and pegs, furniture, barn and house building materials, staffs, wands, walking sticks, flutes, baskets, rope, wattle, fish traps, fencing, writing materials, dock pilings (Alder), boxes, containers and a source of fuel for a fire to cook on and to keep warm by on a chilly day. Other parts of the trees give, fruit, nuts, jellies, jams, wine, beer, cider, cordials and liqueurs, mast, dyes, a mordant, tannin for leather making and medicinal ingredients. The bees are a bit invisible, but because many of these trees have blossoms, honeycomb would have been collected also. Amazing what a little Ogham will tell you. Does Stonehenge have Ogham? Or is this just another coincidence? Stonehenge, a drawing by Alan Sorrell, with a slight addition by J Rankin, from the official handbook, “Stonehenge and Avebury” from Her Majesty’s Stationery Office. This entry was posted in Ancient History, archaeology and tagged ancient mariners, Stonehenge Ogham. It was very multi purpose, the stones tell you that. I had never thought of Belenus, Silvanus and Manawydan being part of one archtype, but then again, I do call Manawydan, astronomer/sailor/merchant/shaman/priest/king, so that would pretty much cover land and sea. Since they used an arboreal version of ‘stick’ writing, Silvanus would be front and centre there. I’m afraid I don’t know the answer to that. I know MTdna J came with the early farmers. Jasmine’s descendents were found at Skara Brae but my great great grandmother was from Llanrwst, North Wales and she was J.